“You've picked the perfect name, now raise the perfect puppy. Here's how... in-depth reports answer the most common dog health and dog training questions. Yours to download FREE today." 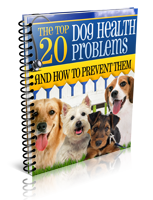 Book 1: "How to Stop the 10 Most Common Dog Obedience Problems"
Book 2: "The Top 20 Dog Health Problems and How to Prevent Them"
Raising a Dog is a challenge. Are you ready? We will NOT rent, trade, or release your name to any third party for any reason - ever. We respect YOUR email privacy and hate spam with a passion.